Life on the New Planet? 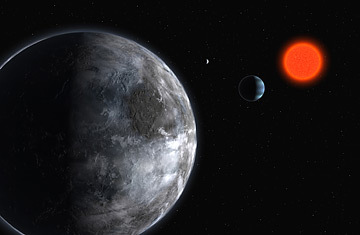 An artist's rendering of a Super-Earth (in red) in the planetary system around Gliese 581. Debating whether suns other than our own have planets has always been like debating whether cats other than your own have kittens. The answer is self-evidently yes. All stars form more or less the same way after all  coalescing out of the same celestial gas and often leaving a dusting of the stuff behind that can, in turn, coalesce into planets. All stars can additionally snag passing bodies in their gravitational lasso, conscripting new worlds to add to the home-grown litter. So it was no surprise in the early 1990s when astronomers began detecting these so-called extrasolar planets circling distant suns, and it's no surprise that in the years since they've spotted more than 220 of them. But the latest one added to the list is by far the best. On Tuesday, a team of European astronomers announced that they had not only found a new planet circling a comparatively nearby star in the constellation Libra, but that that planet is unexpectedly Earth-like. Like Earth, it orbits a comfortable distance from its sun; like Earth, it maintains a surface temperature somewhere between 32 and 104 degrees Fahrenheit. Most importantly, like Earth, it could easily harbor surface water. In the biological arithmetic we know best, warmth and water often equal life. Even if we could visit 581c, there would be reasons to wait a bit before we light the rockets. For one thing, just because the planet could have liquid water doesn't mean it does. The body was detected like all extrasolar planets initially are, not by direct observation, but by measuring the infinitesimal gravitational wobble it causes in its home star. We won't get a clearer sense of its makeup until its orbit carries it in front of the star and the brief interference in the wavelength and intensity of the incoming light allows us to make some inferences about its composition. This will also tell us if the planet has an atmosphere and if it is thin and wispy like Mars's or suffocatingly dense like Venus's  neither of which promises good things for the kind of life we're most familiar with. What's more, there are plenty of far more promising places to hunt for life closer to home. Sunlight is not the only kind of energy that can fire the biological furnaces; so can subsurface heat. Jupiter's icy moon Europa is thought to have a rich, salty, globe-girdling ocean sloshing just beneath its surface rind of water ice. Very little solar light reaches so far into space, and even less makes it down to the dark ocean inside Europa. But the gravitational flexing of the little world caused by the movement of Jupiter's other moons heats up its innards the same way a wire hanger heats up when you bend it back and forth. This is what keeps Europa's ocean liquid, and this could could also help spark life. Mars too could be home to similarly hearty subsurface life forms, as could two of Jupiter's other moons, Ganymede and Callisto. If the discovery here on Earth of tough little organisms living miles below ground, frozen in polar ice and hanging on in the broiling waters of deep-sea vents indicates anything, it's that biology emerges in very improbable places. The most remarkable thing we may come to conclude about 581c is that whatever secrets it holds may not be that remarkable at all.